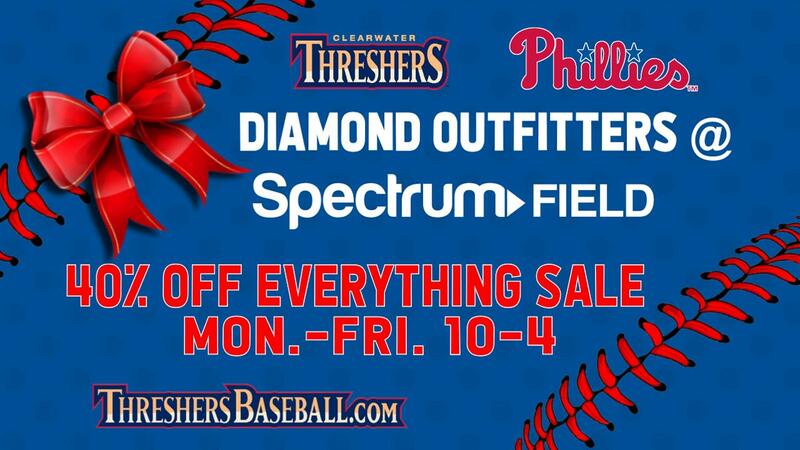 The Diamond Outfitters Team Store Holiday Sale is in effect through December 20, 2018, on everything in the store at Spectrum Field. Enjoy 40% off all Phillies Spring Training, Clearwater Threshers and Beach Dogs merchandise! All in-stock jerseys, hats, T-shirts, outerwear, and gifts are included in the sale; 40% discount valid for in-store purchase only. The team store is open Monday - Friday, 10 a.m. - 4 p.m. and may be reached at 727-712-4429 with any questions. Located at the west entrance of the ballpark, the store is by the west gate.